Device Pitstop of Maple Grove, a business specializing in buying, selling and repair of computers, smartphones, tablets and game consoles, received national certification as a Women’s Business Enterprise by the Women's Business Development Center - Minnesota, a regional certifying partner of the Women’s Business Enterprise National Council (WBENC). I'm proud to be certified as a Women’s Business Enterprise, a unique designation in the technology industry. WBENC’s national standard of certification implemented by the Women's Business Development Center – Minnesota, is a meticulous process including an in-depth review of the business and site inspection. The certification process is designed to confirm the business is at least 51% owned, operated and controlled by a woman or women. To learn more about Device Pitstop of Maple Grove, please visit http://www.devicepitstop.com/maple-grove. Device Pitstop of Maple Grove sells used, overstocked and refurbished laptops from $70 to $1,500. You can also find refurbished tablets and smartphones for sale. All devices have gone through a 21-point inspection and come with a 90-day warranty and theft check. The store also repairs smartphones, laptops, tablets and game consoles. 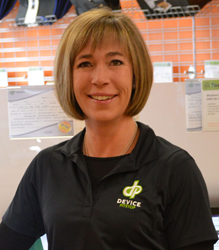 Device Pitstop also partners with schools and businesses to provide extended warranty and maintenance programs on smartphones, tablets and laptops. By cutting out the middle man (brokers, insurance companies, etc.) Device Pitstop offers the most affordable protection/extended warranty plans with most repairs being completed same day. The company also offers services to buy and/or recycle old computers, tablets and smartphones. Device Pitstop is a strong supporter of E-recycling. The owner is Teresa Swenson – a mother of three, scout leader and active parent in the local school district. After 13 years as a 'stay at home mom', Teresa decided to follow in the footsteps of her father and brother. Her dad, Ron Olson founded the company now known as Winmark Corp., which built the Play it Again Sports brand to 800 stores and is behind Plato's Closet and Music Go Round, among others. Teresa’s brother Chad worked alongside his father. Both left Winmark years ago but found success in other concepts. Their new franchise company includes the brands: Clothes Mentor, Children’s Orchard, New Uses and NTY Clothing Exchange.